After 3 years of sold-out shows at Hermann’s and other island jazz venues with the Gerry Mulligan and Chet Baker Tribute, Gord and Olivier Clements are bringing their quintet back for a brand new project entitled “Passages!” The music includes new original compositions and arrangements from Gord’s new musical “Emily - artist, poet, singer!” along with new works written recently for the ensemble by Olivier. 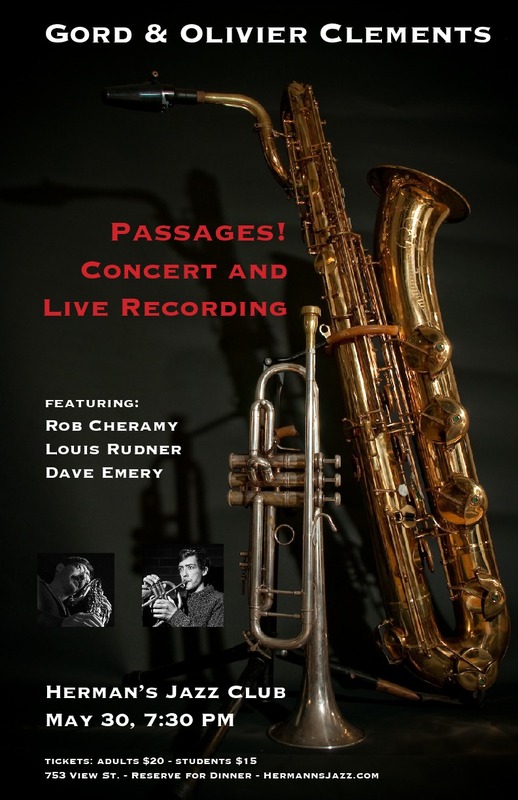 This rare and wonderful event will feature Gord on bass clarinet as well as tenor and soprano sax. Olivier will be playing trumpet and flugelhorn. Joining father and son will be long time music collaborators Rob Cheramy on guitar, Dave Emery on drums and a recent arrival to Victoria, bass player Louis Rudner. After over 30 years on the scene in Victoria, Gord Clements has established himself as one of Victoria’s most prolific multi-instrumentalists. 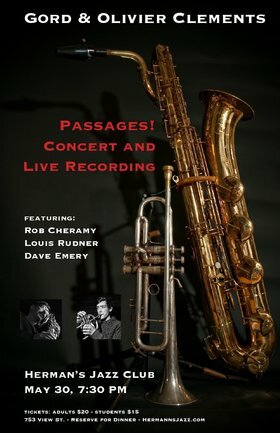 With five jazz albums, an orchestral recording of original works for solo bass clarinet and strings, and induction into Victoria’s Music Hall of Fame in 2009, Clements’ unique career has made his performances inspirational and magical. Olivier Clements has spent the last 7 years collaborating with some of Canada’s best-known indie artists. While extensively touring North America and Europe with Aidan Knight, he has also performed with Dan Mangan, Louis-Jean Cormier, Miss Emily Brown, and recorded for Said the Whale, Northcote, Towers and Trees, and Party on High Street.